From warm gold to brushed bronze, to gleaming copper and rose metallic pinks – having a metallic wedding is a trend that is here to stay. Sequins and mineral tones busted onto the wedding scene in 2016 but is still going strong into 2018. Brides everywhere are incorporating gold and silver accents into decor, dresses, and even their cakes. This trend has gotten so huge that we couldn’t help but emulate it onto custom metallic bridal party shirts for your wedding! 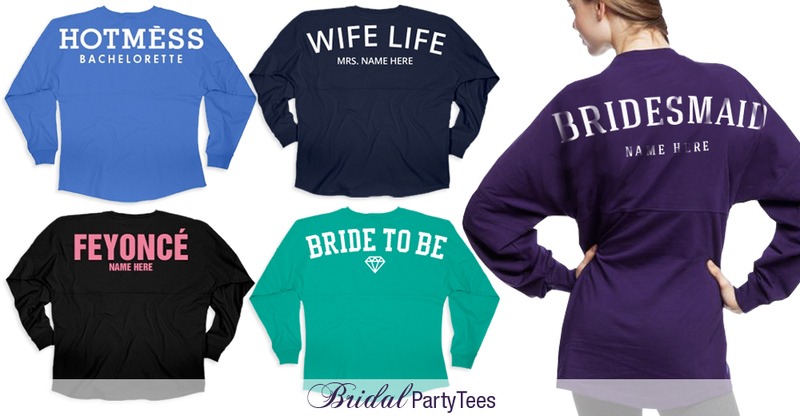 Bridal Party Tees took to Pinterest for inspiration and turned those ideas into glamorously shiny bridal party shirts! What exactly makes our designs sparkle and shine? Foil of course. It is an ultra-thin, shiny film with a metallic appearance. This material is applied to your item at a very high temperature and pressure for a long lasting, vibrant look. Bridal Party Tees currently offers this amazing foil in eight different colors on a large selection of our apparel that includes tank tops, sashes, and even robes. Anyone can easily create a design that vibes with their wedding theme. 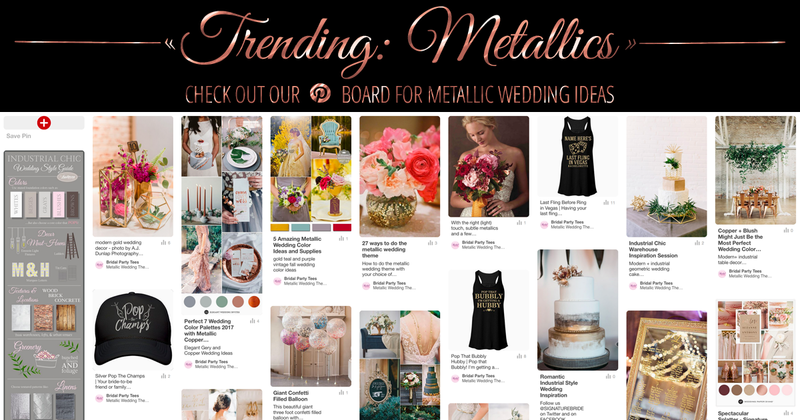 We’ve added all of our favorite metallic wedding trends to our Pinterest page to help all of our brides with their endless wedding planning. If you are still struggling to think of the most perfect additions to your wedding then make sure you check out this board. Bridal Party Tees Pinterest page is a great source for bridal gifts and wedding ideas! 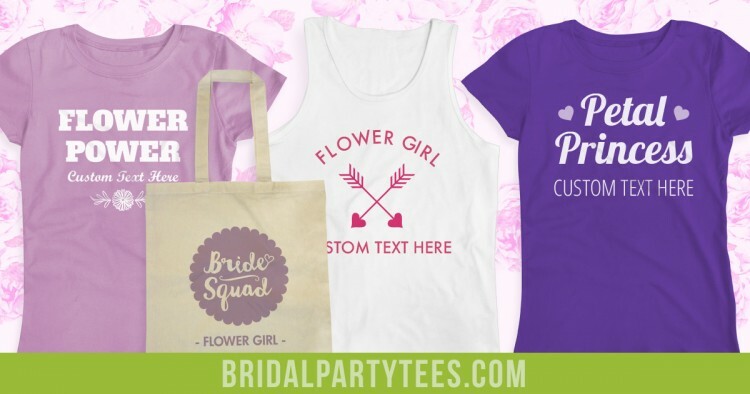 Bridal Party Tees design center has a variety of options in product styles, fonts, and art to allow the user to be as creative as they want but also the effortless functionality to achieve the ultimate, one of a kind design. There’s nothing we love more than offering our customers the best and trendiest bridal apparel online. Design your own metallic bachelorette party shirts and share your pictures with us on Facebook, Twitter, or Instagram @bridalpartytees! When it comes down to the wedding day there is only one other person the Bride is willing to share her spotlight with. In a traditional wedding procession, a flower girl typically walks in front of the bride during the wedding procession and scatters flower petals on the floor before the bride walks down the aisle. Leading the bridal procession is a big job that comes with a lot of attention so make sure to thank your flower girl and let her know how important her role is with a meaningful gift picked out just for her. Surprise your youngest and cutest bridal party member with a flower girl shirt with her name or initials. Bridal Party Tees carries a wide assortment of flower girl designs that are perfect for not only your favorite little attendant but all who helped to make your day special. Choose from one our designs and easily add names, dates, and wedding colors or start from scratch. A flower girl shirt is a cute and intimate component to add your to your wedding but also a great detail to make her feel important and special. She can wear her one a kind shirt to the casual welcome dinner party and during the morning of the wedding day before she puts on her dress. While a custom shirt is our favorite option, we offer additional products that would work for your petal princess. Sweatsuits, tote bags, and teddy bears personalized with her name and initials would all make her smile. 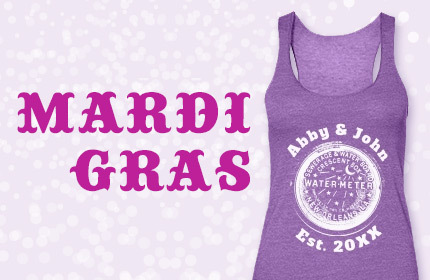 At Bridal Party Tees, we offer no minimums so you can easily create one design or 20. Go all out and create matching designs across multiple products! Our design center makes it incredibly simple and effortless to create matching designs across every product we offer. Your wedding day is one you will never forget and chances are nether will your flower girl. Create a memory that she will never forget with a custom flower girl shirt! 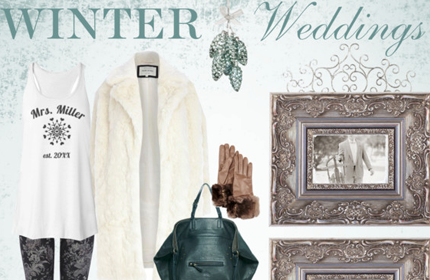 Many brides opt having a winter wedding versus a summer wedding for many reasons. One of the main reasons being that it is incredibly cost effective. The second being that are so many amazing ideas and decor options to choose from. 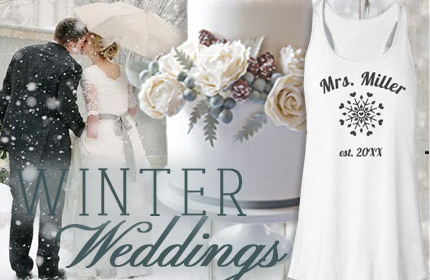 Whatever your reasoning may be, Bridal Party Tees wants to help you plan your fabulous winter wedding. We all know that planning a wedding is stressful and of course costly but it doesn’t have to be that way because having your wedding in the winter can make your nuptials truly unique. As many know, we love Pinterest. Having the ability to visually search for ideas and see what is currently trending is not only a great research tool but an amazing way to store all of our concepts. Plus we our inspired by what we find everyday! We take those inspirations and make our own unique designs to give our customers better products. 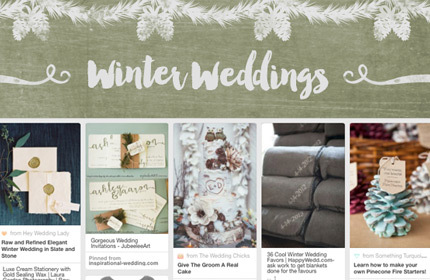 This doesn’t mean Pinterest is only an excellent choice for us because it’s even better for you as the bride. We’ve put together all of our favorite and truly one of kind ideas and put them all on our winter weddings board to assist you in your decision making. After checking out our Pinterest board you can see that we give you copious amounts of ideas and directions to choose from. Your winter wedding doesn’t have to be only inspired by Christmas, even though we certainly love that concept, but it can be about what really reminds you of what winter is and what it means to you. If you are still struggling to think of the most perfect additions to your wedding then make sure you check out this board! Bridal Party Tees pinterest page is a great source for bridal gifts and wedding ideas! As many know at Bridal Party Tees, we pride ourselves on not only having the latest trends but being trendsetters in the bridal apparel industry. So what’s hot right now in the custom apparel world? Game day jerseys of course! Bachelorette parties are taking on this new trend to show off their team bride spirit and we want to give our customers the opportunity to optimize on this new craze. 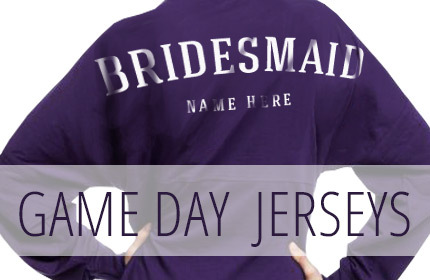 Our bridal spirit jerseys are meant to be worn baggy with slightly arched text across the shoulders. This way when you place your hands on your hips your design is prominently displayed. We use highly durable, fade-resistant vinyl film material when printing on these products that gives your design a long lasting and vibrant print. But the best part of this new style is that they are incredibly comfy and with a long lasting print, you can wear your jersey for years to come! Our designs are already amazing on their own but every user has the option to customize every design in our gallery. This means you can easily take any design you like and switch out the style or color and then add your own art or text! Don’t like any of our designs? No worries. Start from scratch and add your own original concept. However you’re planning on spending your bachelorette party, Bridal Party Tees has all the essentials you need. We have the trendiest apparel and offer a wide array of custom accessories. But when it comes to the newest and latest trends in bridal apparel we want to hear from you! What’s the cutest and latest trend you’ve seen at bachelorette parities or for the bride to be? 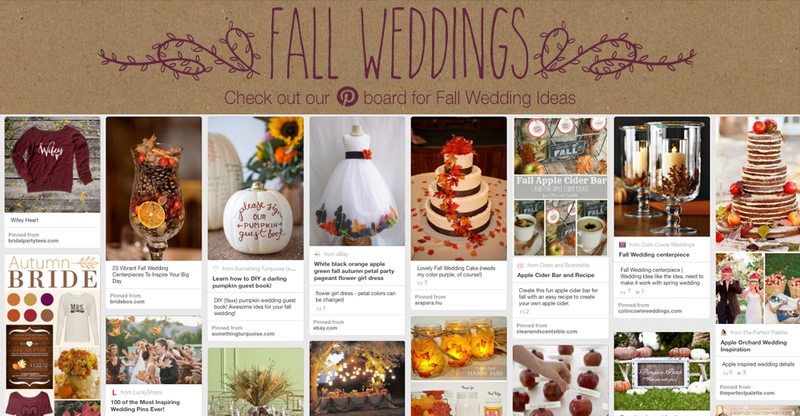 Second to summer, fall is a big season for weddings. Whether it’s the decor, food, or even the color scheme – fall is an amazing time of the year. There are so many directions you can take when planning your big day that it can be overwhelming. There’s no need to panic because Bridal Party Tees is here to save the day by offering you some great options and choices that will make your wedding extra special and memorable. The best way to plan your wedding is to see what others have done, and as many know, Pinterest has become the ultimate wedding resource. 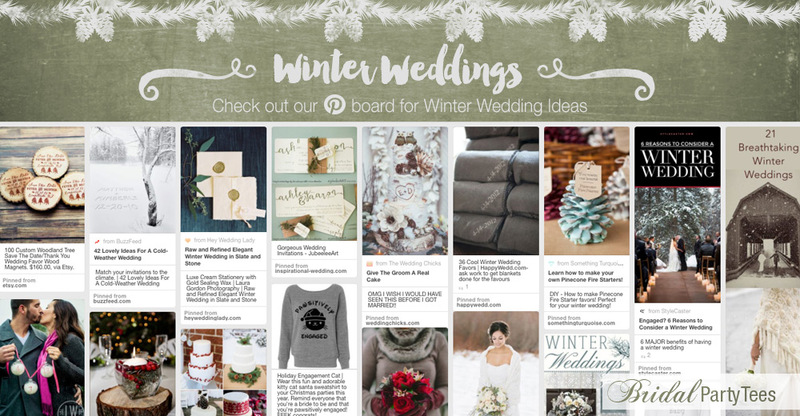 We cannot get enough of Pinterest at Bridal Party Tees and we use it every day not only as a marketing tool but to research the newest trends in weddings. During our research, we’ve collected and stored amazing ideas and touches that will take your wedding to the next level. 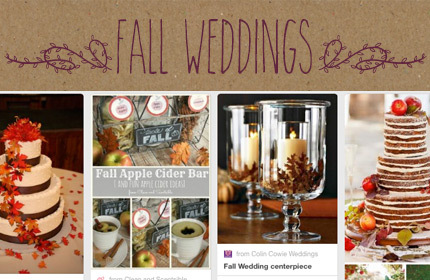 Fall in love with our Pinterest board and get inspired for your upcoming wedding! Summer is prime time wedding season and with only a limited amount of days to choose from you might be considering a 4th of July theme or day. It doesn’t necessarily have to have a red, white and blue color palette with stars and stripes as accents. Your theme can most certainly take a different route giving your wedding a more elegant and glamorous feel. There are so many great Americana ideas that can be used for your wedding day. 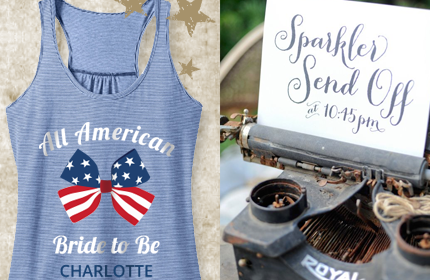 To help get you started, Bridal Party Tees has put together a July 4th wedding inspiration board. Stars, stripes, fireworks, flags – there’s all sorts of patriotic concepts that you could include in your wedding day details. What’s best about this theme is that it can be incorporated not only for Memorial and Labor Day but as a military or a great summer fun theme. Design a custom bride shirt to make your getting ready process even more special. Include your wedding colors, future last name, and date! One of the best parts of the parts of the 4th of July is the delicious food and treats that come with it. Grilling and barbecuing play a large role in this holiday but that doesn’t mean you have to a full on spread of down home cooking. Incorporate options like corn on the cob kabobs, pulled pork sliders, or a specialty watermelon cocktail. It’s all about taking a classic option and putting your own unique spin on it. Nothing says it’s the 4th of July like booming fireworks that light up the night sky. End your wedding with a bang (literally) with a firework display specially for your guests. If fireworks don’t fit your wedding budget or you can’t find the right location a the end of the night, then a romantic sparkler send off from your guests is a just as amazing and memorable. Maybe having your wedding on a holiday isn’t in your cards but is a great option for bachelorette party get away. Bridal Party Tees has trendy and stylish 4th of July bachelorette party shirts and accessories to start your last night as a single lady off with a bang! What are some of your favorite 4th of July wedding ideas? Let us know and make sure to check out our 4th of July wedding theme pinterest board to get some great ideas!